The new GCSE grading system has “ratcheted up the pressure” on teenagers, school leaders have warned. Heads have raised concerns that GCSE reforms in England could have an impact on the mental health of young people, adding that schools have responded to the situation by giving students extensive support to help ease stress and anxiety. Teenagers across England, Wales and Northern Ireland will receive their GCSE results on Thursday. According to one study, as few as 200 students could score a clean sweep of 9s – the new top grade – in all of their GCSEs this summer. Under the biggest shake-up of exams in England for a generation, traditional A* to G grades have been scrapped and replaced with a 9 to 1 system, with 9 the highest grade. One expert argued that last year, a higher percentage of English and maths entries gained the two new top grades – 8s and 9s – than the proportion of A*s awarded for the two subjects in 2016 under the old system, a pattern that could continue this summer across more subjects. But some may feel disappointed with grade 8s as it “does not feel as grand as the old A*”, it was suggested. English and maths were the first subjects to move to the new grades. 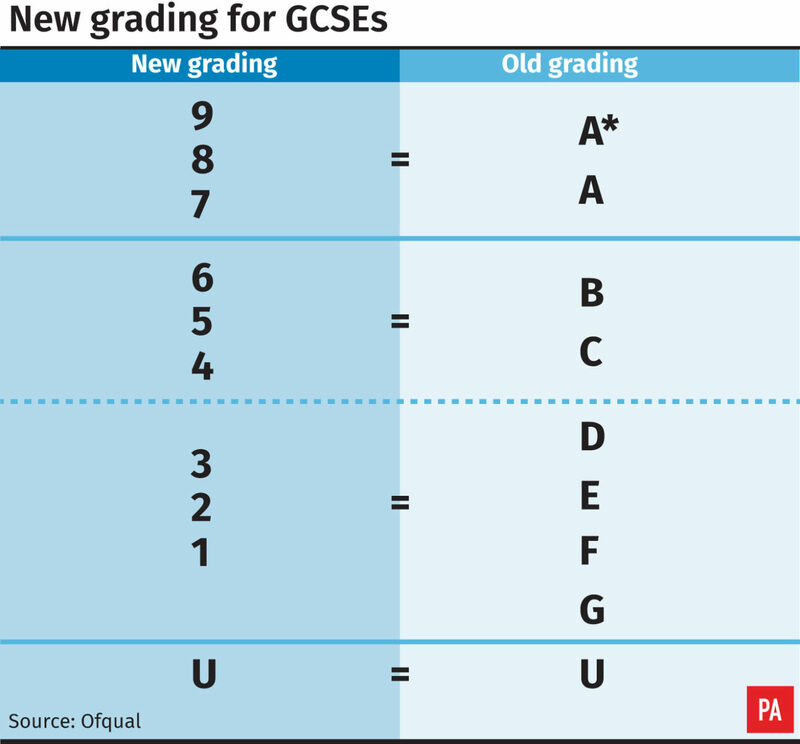 This year, 20 subjects will be awarded the new-style grades – with a grade 7 broadly equivalent to an A under the old system, and a 4 broadly equivalent to a C.
Geoff Barton, general secretary of the Association of School and College Leaders, said: “We are concerned that the new grading system for GCSEs ratchets up the pressure on young people another notch. “It was already very hard to achieve the top grade of A* under the old system, and it is even harder to achieve the top grade of a 9 under the new system. Teenagers should be aware that the “bar has deliberately been set at a higher level” under the new system, and they should “take great pride in their results”, he said. Mr Barton added: “The new grading structure is another aspect of a very significant set of reforms to GCSEs which has put young people under a great deal of additional pressure. “The new exams are harder, contain more content, and involve sitting more papers. “We are worried about the impact on the mental health and wellbeing of young people caused by these reforms and it is our view that such a substantial set of changes as this should have been introduced in a more managed and considered manner. Under the new system, there is more differentiation between results – with three top grades, 7, 8 and 9 compared to two A* and A under the old system. Professor Alan Smithers, director of the Centre for Education and Employment Research at the University of Buckingham, said that his analysis of last year’s GCSE results for 16-year-olds in England only showed that the changes have created “more room at the top”. Fewer English and maths entries were awarded a grade 9 than gained an A* in 2016, he said – 3% against 5.5%. But a further 6% of entries got a grade 8. This means that overall, 9% of entries gained a grade 8 or 9, against 5.5% awarded A* in these subjects in 2016. “Parents, pupils and schools have increasingly tended to see straight top grades as the acme of success in GCSE,” Prof Smithers said. An Ofqual spokesman said: “Fewer grade 9s will be awarded in each subject than A*”, adding that grades 9s are intended to reward “exceptional performance”. Mary Bousted, joint general secretary of the National Education Union, said: “This year, like last, it has been virtually impossible for teachers to predict their students’ results because of a lack of certainty in the new 9-1 grade boundaries. “We know that students who could have expected to receive an A* in ‘legacy’ GCSEs will be disappointed if they receive an 8 rather than the top grade of 9. What’s the purpose of the hajj pilgrimage?